Back in 2013 Bianca and I ran Project Learning Swap Meet (PLSM) at the Powerhouse Museum, or as one of my students says, “AKA The Museum of Applied Arts and Sciences (MAAS).” This was a whole day of professional learning for primary and secondary teachers from all sectors, as well as academics, on Project Based Learning and how to design and implement authentic projects for students to engage in. Basically the ins and outs, the dos and don’ts of PBL. Awareness – through engaging in Project Based Learning, students raise public awareness about some local or global issue or problem that needs addressing. Action – through engaging in Project Based Learning, students take action in order to solve or help to solve a local or global issue that needs addressing. Advocate – through engaging Project Based Learning, students advocate for a particular cause. After discussing the 3 As with Suzie, I was massively inspired, but still couldn’t really see how they could be achieved effectively within a classroom setting. 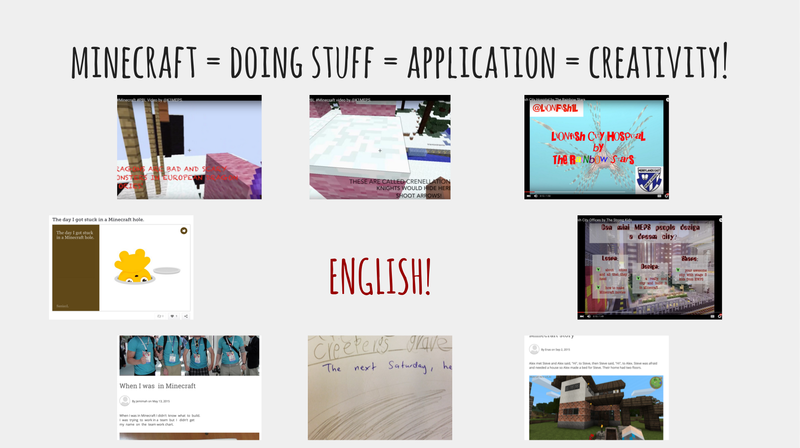 Over the last few years my class Minecraft projects (that’s Minecraft the actual game, not the super lame ‘Education Edition’ offering from Microsoft) have kind of been building (pardon the pun) on from one project to the next. Our Minecraft world has kept expanding as we keep adding more and more interesting builds along with each project. This is all pretty well documented so I won’t go into any great detail, if you want to know more about our Minecraft work, just scroll through some of my earlier posts. I will however quickly mention #Project360. Last year my class researched some of Taronga Zoo’s ‘legacy species’ of endangered animal from around Australia and south-east Asia. After researching the animals, their threats, and some of the things that we may be able to do to help the animals, my students built an endangered animal conservation park in Minecraft and made video tours of each enclosure which were recorded using the Replay mod and rendered in 4k 360º, uploaded to YouTube and can be viewed in 360º using Google Cardboard or some similar headset. We also put on a cinema day at the school and raised $150 for the World Wildlife Fund. Now this was great, and you might already say that the 3 As of Project Based Learning were already enacted as part of this project – students raised awareness of the plight of the animals by making interesting videos and sharing them on social media, they took action by putting on a cinema day and raising funds to help save the animals, they advocated for sustainable living practices and other ways that we can each do our bit to help keep these creatures alive. However, things get even better. Our work as part of this project saw us get an invite to the Young Creators Conference at the MAAS to showcase this work and some of our more recent VR work with the HTC Vive. We set up our Minecraft server at the museum along with a Vive, and we also brought along some Google Cardboard headsets so visitors could view our videos and explore our Minecraft world by playing the game and also experiencing it in VR. It was a great day. During the event we were lucky enough to meet one of the national managers of the Stockland shopping centres who invited us to run a similar showcase at their Merrylands centre. We agreed and just this Thursday my students and I set everything up at their local shopping centre and ran a similar showcase for the public. It was really awesome. Between 5 – 7pm, as customers went about their Thursday night shopping, my students invited them in to a little enclosed area just outside Woolworths to check out our work, to watch our videos and experience our work in virtual reality. We had interest from people as young as 5 and as old as 50. My students raised awareness of the plight of our local endangered animals and told customers the different ways in which we could help. They took action by conversing with parents and students from nearby local schools and other members of the general public, explaining what we were doing. They became advocates for the animals, for sustainability and sustainable living practices. They were amazing. The event ran really smoothly and I was so impressed with how well my 10 and 11 year old students communicated with everyone and conducted themselves in such a public space. The 5L Ocelots truly rule. I feel like I’ve finally managed to achieve the 3 As with my students, and it’s a bit of a milestone which felt somewhat vague and unachievable back in 2013 after that Skype conversation with Suzie Boss. It’s also opened up a meaningful connection with Stockland and the possibility for running further events in the future, perhaps even a holiday showcase when their centre is even busier. Authenticity – students engage authentically with community members outside of the classroom. Whilst this is a necessary component for any class project to truly live up to the ‘gold standard’ of PBL, it can’t hurt to add ‘authenticity’ to a list while we’re in the business of listing As. Awesomeness – the learning should be awesome. You’re just going to have to take my word for it when I say it’s been awesome working on this stuff with my class and seeing how great they are at communicating their learning to the public. I’ll put some photos below so you can have an idea of how the event looked. It’s really about getting students outside of the classroom and to realise that they do have the capacity to do things with their learning that extend beyond school. If they want to, they can change the world. Last week I was interviewed by some film students from Macquarie University for an upcoming conference on technology and education soon to be held at their institution. Among the many questions they asked me was, “What’s one of the biggest changes you’ve seen in technology and its use in education in recent years?” My answer was the swift advances in Virtual Reality technologies and how they can be implemented effectively within a classroom setting. I don’t know whether or not this is true, but it’s certainly been noticeable from where I’m sitting in my little blip on the edusphere. Last year this video of Mark Zuckerberg speaking about the potential of Virtual Reality technology to impact our daily lives was released, and back then, it still seemed like this impact was some way off. I now, however, don’t think it’s that far away. We have, for instance, Google’s endeavours into the Virtual Reality in education realm with Google Expeditions. The idea is that students get to go on virtual field trips to far away and difficult to reach places while remaining in the relative comfort and safety of their classrooms by strapping on a Google Cardboard headset and going on a VR mission. Aside from consuming VR content, my class has recently created a series of 360º VR videos and uploaded them to our class’ YouTube account. This project saw us put on a 360º VR Cinema Day to raise awareness and a small amount of charity funds for WWF Australia to help the plight of the endangered species they were researching. This brings us to the Young Creators Conference at the MAAS. On Friday some of my students and I visited the MAAS to share our project with a large crowd of other students and teachers who are also making some interesting moves forward in STEM/STEAM education. We brought along a handful of computers and cardboard headsets so that visitors to our area could explore our server and view our videos in VR. Interestingly, the headsets we used were donated to our school by the Commonwealth Bank, who also have taken to VR to educate children about financial literacy in new and interesting ways. What was new here for us was the use of the Vive. We’ve recently figured out that our MinecraftEdu world can be ported over to regular Minecraft and that through the installation of the ViveCraft mod, we’re able to share our world by strapping an HTC Vive headset on those interested and walking them through it as they experience it in VR! 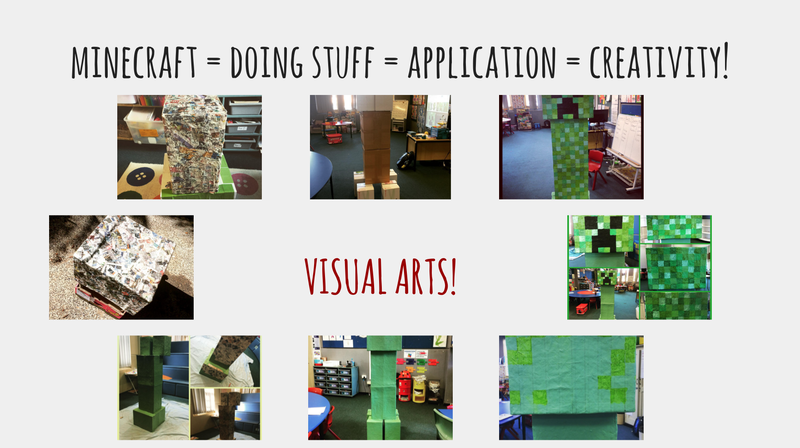 This adds a whole new level to how students engage with and articulate their learning. Below I’ll share some photos from the day. It really was a great opportunity for students from all sectors to share their learning experiences and some of the great things happening in NSW schools. Particularly great for my students as some of them may not get out to places like the MAAS very often, and wonderful to see them as facilitators and exhibitors. Here’s a video of one of my students experiencing our class work in VR for the first time. So cool! We’ve been extremely lucky to have been loaned a Vive setup from the awesome peeps over at Coder Academy and can’t wait to start pushing things further. 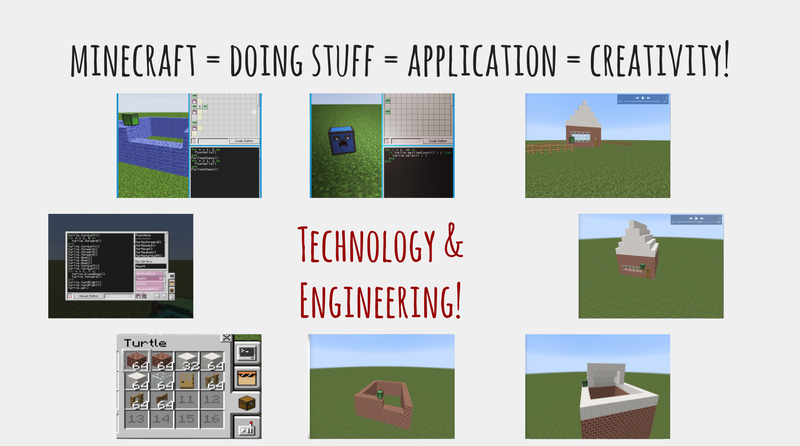 We do quite a lot of our work in Minecraft and we’re currently looking to move away from the ‘edu’ versions so that we can do some more with VR. The original MinecraftEdu is still cool, but it’s stuck back in 1.7.10 and it won’t be too long until it starts looking a bit outdated. Also, it’s not compatible with Vivecraft. Furthermore, Minecraft ‘Education Edition’ doesn’t support any mods whatsoever, so trying anything like this won’t happen for quite some time on that platform. We need mods. For example, how cool would it be to walk through a tiger enclosure in VR with mods like Mo’ Creatures, Animals Plus or Lots of Mobs installed? Not gonna happen with MEE. We need to keep moving forward, but the removal of the ability to mod is a serious step back. We’re currently running the necessary tests to get regular Minecraft running at school and all is looking quite well. Pretty soon we plan to be collaborating in VR with our friends down in Wooranna Park and pushing things forward on their vanilla server. The idea is that school visitors can experience virtual reality tours of our builds while our students explain what they’ve been learning and making. #ProjectDreamtime: connecting with Arnhem Land and learning about culture. On a recent summer road trip, up through Uluru, Darwin, over to Cairns and back down to Sydney, I became inspired. Inspired by the landscape, inspired by the epic wet season weather, inspired by the stories and culture of the Indigenous people of northern Australia. I got to see Uluru in a once in 50 year downpour, with waterfalls streaming down its ancient surface, after sheltering with my family and some local children from the rain in a cave covered in 30,000 years worth of rock paintings. I was lucky enough to see the Todd River in Alice Springs flowing with recent wet season runoff, an event which is apparently also a once in a lifetime opportunity. I learned about Lightning Man in Kakadu National Park, and how his children, ‘Alyurr‘ bring the wet season when they arrive to the desert. I learned of the evil spirit, Narbulwinjbulwinj, and many other dreamtime stories. I was interviewed on SBS and became famous, lol. True story. All of these experiences got me thinking about the ways I could use them to teach my students about Indigenous culture and the dreamtime stories. I think it’s important that when our students learn about Australian history, they start with a solid foundation of and respect for the first Australians and the culture which was established tens of thousands of years before any Europeans had ever laid eyes on the beautiful country we now know as Australia. After learning about the awesome ‘Momotaro the Peach Boy’ project by John Miller’s students, where they worked as a build team to recreate the story in Minecraft, I thought that it’d be an awesome idea for my class to do the same with some Aboriginal dreamtime stories. So over the last couple of weeks of the summer holidays, I designed the project outline, which is guided by the driving question, ‘How could new technologies be used to tell traditional stories?’, and set about trying to connect my class with some schools from remote Indigenous communities. In fact, I emailed probably around 50 schools from remote NSW, QLD, WA and the NT, trying to establish connections. I finally managed to secure a connection with an awesome school from Arnhem Land in the Northern Territory, which I’ll write a little more about later. I also contacted the AECG and organised for a visitor to come to our school with some Aboriginal artefacts and to introduce the students to Indigenous culture. His name is Des, and he came and spoke to the students, showing them his boomerangs, which were handed to him by his father and grandfather, a kangaroo skin and some other artefacts. He played the didjeridoo, and explained how it was only the boys and men who were allowed to play. The boys had a go at playing and we all laughed along as they made ridiculous noises. Des explained the concept of totem animals and performed the creation dance taught to him by his father and grandfather, which explains how Baiame came down and created all of the geographical features and the creatures of the land. It was a great visit and we hope to be getting him back at the end of the project to show him what we have learned and made. Photos below. We have also been speaking with some students in Arnhem Land via Skype. The students in 5L and 4/5H came up with some questions to ask the students from Arnhem Land. Things like, “What is your favourite sport?”, “Have you ever been out of Arnhem Land?”, “What do you like to do for fun?”, and all the other sorts of things that kids are interested in learning about from other kids. They also asked if the Arnhem Land students had ever seen a crocodile, to which we got the awesome answer, “We HUNT and EAT crocodile!” It was a real eye opener for the Merrylands East students to hear and learn about a traditional way of life that is still being lived today. They told us that crocodile tastes “sweet” and “a bit like chicken.” They also told us of the other animals they hunt, such as the long-neck turtle and sting ray. They told us of their totem animals and which belonged to their families. Interestingly, one of the Merrylands East students asked if the Arnhem Land school was K-6 or K-12, and they told us that the school is more like ‘birth to adulthood’, with the mothers bringing their children to the school a few weeks after birth and continuing to visit and attend right through until they’ve finished high school and moved on to employment. They explained how children are taught their home language in conjunction with English, with two teachers working alongside each other, and that the elders also take the students to teach them their stories. A really interesting place, and a cool school setup with wonderful people. They have sent us some questions for our students and we will be contacting them again via Skype this coming Thursday to answer them. Such a cool connection to have. As well as this, students in 5L and 4/5H have been using the class website PBL page to research dreamtime stories from around Australia. Working in groups of 3-4, they have now chosen a dreamtime story to build using Minecraft for the purpose of making a screencast retelling of the story. Their builds will be confined to a Minecraft ‘shoebox’ with dimensions ‘100*80*60’. These are the same dimensions of the shoeboxes used by John Miller in the Momotaro video linked to above, and I thank John for his friendly correspondence in passing on this information. The shoeboxes have been aligned in an 8*8 array, on a specially dedicated and purpose built superflat area on the MEPS-Wooranna Minecraft server. Some photos below, I can’t wait to see the wonderful creations that are soon to fill these boxes. 8 of the groups had all decided that they wanted to build the same story. It’s a story called ‘The Curse’, which they found on the Dust Echoes website, via the class weebly. It tells the story of a jealous witch doctor who sings a song around the a campfire in order to make another man sick. He summons the Namorrodor, and evil, dragon-like creature that eats the hearts of babies and preys on the sick and the elderly. The namorrodor possesses a baby in the sick man’s family and it attempts to kill the sick man before being sent off by the man’s wife, who is a also capable of magic. The lady becomes furious, turns into a crow and flies to the witchdoctor’s cave to kill him. I’ve set a requirement that each group must explain the moral of their stories in their screencasts. We discussed that the main moral from The Curse is to ensure that we care for our young, sick and elderly, as we have been looked after when we were young, cared for when we were sick, and that when we become old, we will also need to be cared for. So 8 groups will be working as a build team to build that story. We have separated it into 8 different scenes, and each group is now responsible for a different scene. Other groups in 5L have chosen to build Tiddalick the Frog as well as Mirram The Kangaroo and Warreen The Wombat. There are also 10 groups in 4/5H working on other stories. It’ll be great to see them all finished and for students to share their stories with each other and learn from the videos made. We will also be sharing the videos on our class YouTube channel so the students in Arnhem Land can view them, as well as some of our friends in America, New Zealand and Canada. 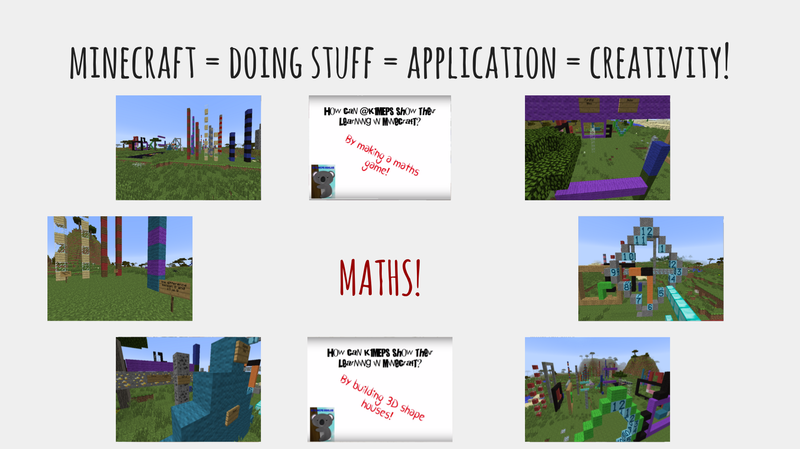 Creating Virtual Reality Content in Minecraft with Year 4. 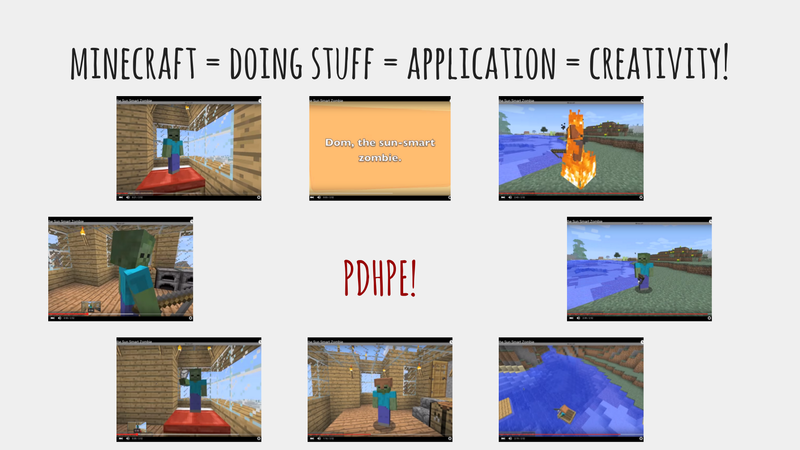 I started using Minecraft within a Project Based Learning pedagogical approach whilst on my second practicum up at North Star Public school back in 2013. A group of year 3 kids used it to build various life events in order to tell the viewers their life stories via screencasts. Since then, I’ve used it in various projects, spanning across the K-6 curriculum, ranging from maths games and life cycle screencasts, to building a city with year 1, some extreme environment bases with year 4, and sharing a class server with kids from Wooranna Park Primary School, Newlands Intermediate School in Wellington, New Zealand, as well Lake Shore Tundra up in New York and Marco in Rome. I have also used the game as part of an after school Coder Dojo to help teach kids from year 2 and year 4 the basics of coding. 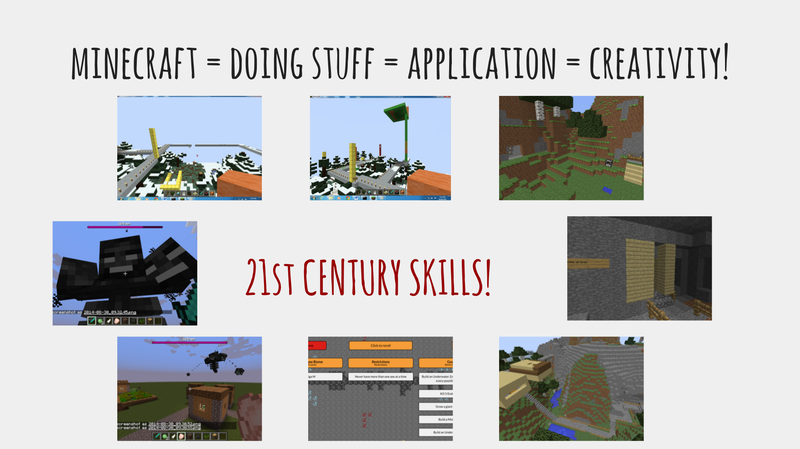 My latest class project, which we have just finished and I am about to describe, is perhaps the project that has challenged me the most, both as a player of Minecraft, and from a classroom perspective. It was also, however, way cool! 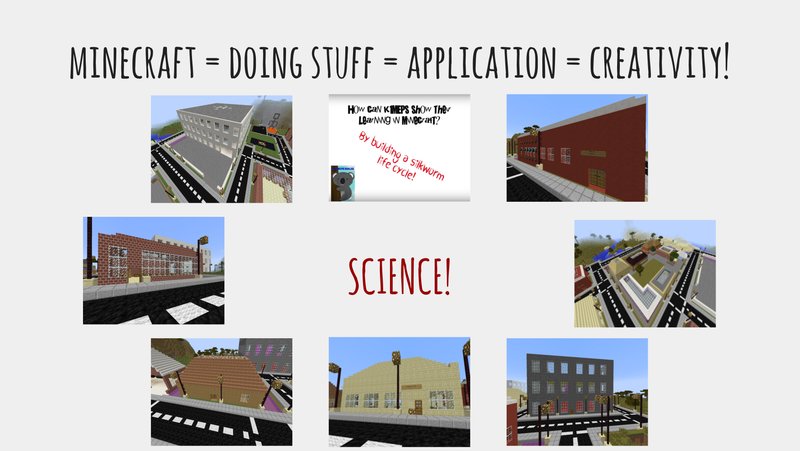 The project, which was guided by the driving question, “How can we use Minecraft to help endangered animals?” was focussed on having kids learn about human impact on the environment, sustainable living practices and animal conservation. It started with a hook lesson which took the format of an excursion to Taronga Zoo, where kids learned about the legacy species of endangered animals that this organisation is hoping to raise money for as part of their centenary year celebrations and beyond. We didn’t go into great detail here, because hook lessons are meant to be fun. We simply noted the fact that the zoo was 100, and there were animals that needed our help. The threats to their animal. Ways in which we can help. We also did quite a lot of explicit teaching around global warming, deforestation, ocean pollution, and other threats to these animals (such as chytrid fungus and how humans might spread it), sustainable living practices and other environmental stuffs. Students were also given a plot of land on our shared Minecraft server, on one of two islands which were directly adjacent to the MEPS Book Review Zone on the server where my class has recently written in-game book reviews and character descriptions as part of a global book review project they were working on just prior to this one. Anyway, on these plots of land, students built enclosures for their endangered animals and used the above-mentioned research as the basis of scripts which they later narrated over some screencasts. Pretty much business as usual, right? Yes, except that their screencasts were recorded in 360º, so that when they were uploaded to YouTube they’d be viewable from all angles with virtual reality headsets such as Oculus Rift or Google Cardboard. This is where things got a bit complicated. To make our Minecraft worlds compatible with vanilla Minecraft, we had to use version 1.8. We also had to run with Forge Mod Loader 1450 so that we could run the Replay Mod in order to record the 360º VR content. The editing of the videos, which is the relatively simple part was done in Adobe Premiere Pro, which I had pushed through on several of my class PCs during the holidays. To learn how all of this stuff worked, I was guided by the awesome Nick Patsianas, who basically sat with me in Google Hangouts and TeamViewer for about four hours for a holiday PD session and made sure we had everything installed and running properly and that I knew how it all worked, lol. Let me just say that the process of recording is quite tricky. The kids took a while to master it, but they totally got it and the videos look and sound completely awesome. I’ll post them below, but I’ll just explain the recording process as quickly as I can. 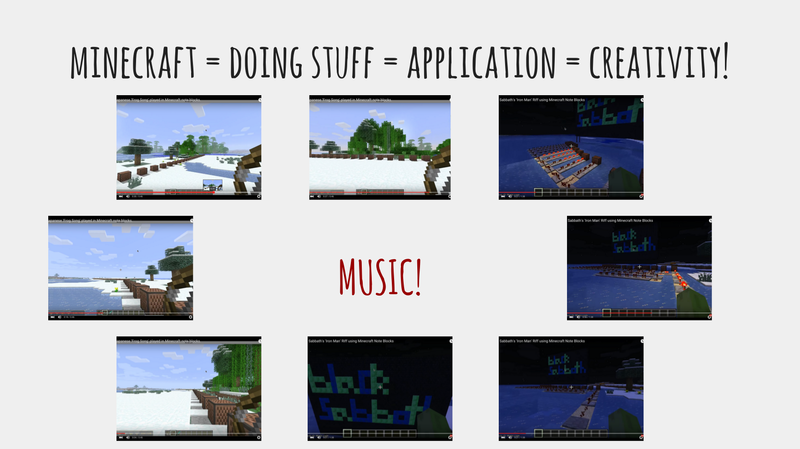 You basically record the screencasts using the Replay mod in first person and then record a recording of your recording in third person by hovering within the recording on an invisible Minecraft camera dolly. I’ll add a photo below, in the hope of making this easier to understand. You also have two timelines for recording; the first person timeline and the third person timeline. You play the first person timeline ahead of the third person timeline to some degree before adding a ‘time zero’ position and time keyframe and then catching up to the other timeline and adding new position and time key frames at different points in time along the third person timeline which creates camera pathways between different times and positions. This is all recorded in 360º via a setting on the Replay mod. If that sounds confusing, that’s because it is a bit at first, but with a bit of practise, it all becomes a lot clearer and easier. I must admit, I think my class got it more quickly than I did. The mod is also quite CPU intensive and only three of the computers I put the software on ended up being up to the task. This made the recording sessions quite hectic as we all had to negotiate sharing the limited computers within a short period of time (we had a deadline to share the videos with Taronga Zoo by Week 5, which I had miscalculated as week 6, whoops!). Technology fails are great. Check the photo of the recording process below. The top timeline is the first person timeline and the bottom is the third person timeline. OK, so we made our videos and we have shared them with the zoo. We were hoping on getting to and end of year event at the zoo called ‘Kids Teaching Kids’, where kids show other school kids at the zoo some of the stuff they’ve made after learning about these animals. I’d be tipping that none of them have made 360º VR content, lol, I am pretty crazy. We didn’t make it to ‘Kids Teaching Kids’, but to finish off the year, we’re going to hold a 360º VR Cinema Day where all of the classes get to come to the library and watch our videos. The Commonwealth Bank recently visited our school and left a bunch of Google Cardboard style headsets, so the timing couldn’t have been more perfect. I have 7 cardboard headsets set up like the one pictured below, so kids will get a chance to strap them on and view our videos in VR. I can’t wait to see their reactions! We’re going to sell a little bit of popcorn, fruit skewers and stuff and have the option for kids to leave a single/silver coin donation which we will fling to the zoo as part of their legacy campaign. The class is heaps excited about putting on the event and recently taught them how to use Canva to make posters advertising the event and invitations for the other classes. You can see some of them below. They are screenshots of .pdfs, so they may look a bit pooey. If you would like to view our videos, they are embedded below. If you have headsets like the ones above, you can totally experience them in VR. Thanks for watching!